Basically the past week my department manager has really been going over the trends for our pre-fall merchandise. Mostly what the hot items are going to be. I am loving the trends for this fall from all of the designers were carry. There are a few pairs that are absolute must haves for the fall season! One of the hottest trends for this fall are pointy toe pumps. Almost every pump we have received for fall merchandise has a pointy toe. I have fallen in love with so many of the styles, so I know customers will too! Our target customer for our area is a more conservative lady, therefore, we do carry a more moderate heel height to meet her needs, but we definitely have plenty of different styles to choose from. A few other trends you can look forward to for fall are, open toed booties (LOVE LOVE LOVE), bow pumps, suede to pony hair, and shiny shiny shiny! Overall, I'm pretty much in shoe heaven at Nordstrom! Our pre-fall show case event is tomorrow giving our customers the opportunity to get their fall merchandise asap. We are also giving out gifts, and having contests. It should be a lot of fun <3 ! Fav style of the week! 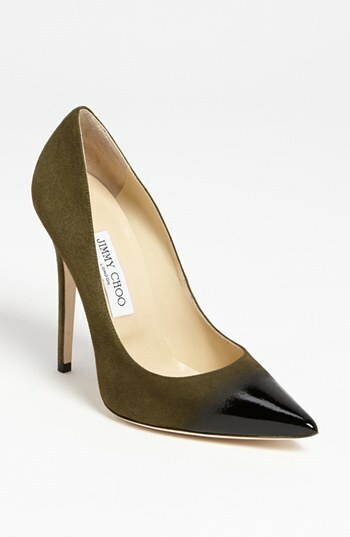 "Jimmy Choo 'Anouk' Degrade Pump"